Wolfes General Store/Slate Run Tackle Shop are for sale! Pine is flowing high and muddied due to Friday's 1.5 inches of rain. Hatches were occuring in very good numbers before Friday's rain, but will no doubt pick up again by Monday without additional rain. Dark boddied caddis size 16-18, BWOs size 18, Quill Gordons size 12-14 and the beginning of the Hendricksons size 12-14. $10 and $20 membership pins or a $50 membership gets a trout license plate and Gold Pin. Help the Brown Trout population in Pine Creek - join The Slate Run Tackle Shop's Brown Trout Club today! Depth Clarity: Muddied with very limited visibility. Pine's is hgh and muddy from Friday's 1.5 inches of rain. Pine Creek should clear by Monday with all of next week looking very good, however anglers should phone the Slate Run Tackle Shop for updated conditions. The Brown Trout Club will be stocking The Stretch on Pine Creek this coming Thursday, April 25th. Anyone wishing to help should meet Tom in the parking lot of Wolfe's General Store/Slate Run Tackle Shop at 1 p.m. on 4-25-19. Generally, hatches have been fairly heavy on Pine this week. .
1.64 ft. = 300 C.F.S. 1.70 ft. = 350 C.F.S. 1.82 ft. = 431 C.F.S. 2.01 ft. = 572 C.F.S. 2.25 ft. = 764 C.F.S. 2.49 ft. b= 956 C.F.S. 3.00 ft. = 1410 C.F.S. 3.20 ft. = 1710 C.F.S. 3.44 ft. = 2100 C.F.S. 3.70 ft. = 2510 C.F.S. 4.00 ft. = 3000 C.F.S. Stop in the Shop for your 2019 Brown Trout license plates and pins. Until Pine clears, look for larger Wolly Buggers and Streamers in sizes 4-8. Fish the edges and near underwater protective structures. Once Pine clears, try to match the hatches lisyted above, or try a Parachute Adams or a Patriot in various sizes from 12 to 18. 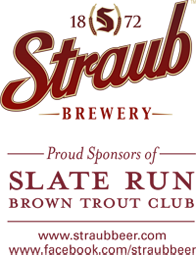 Straub Brewery of St. Marys, Pa. makes a very substantial donation to the Slate Run Tackle Brown Trout Club each year. We are doubling our Brown Trout Club stocking from $10,000 worth of trout to $20,000 worth so that the whole catch-and-release trout stretch will have the same trout density as the delayed harvest did in the past. These large, wonderful fish offer a great experience for trout fishermen in "The Stretch." Since it is a "catch and release" area these fish will offer many repeat opportunities to trout anglers throughout the year, and we have found there are many very large holdovers lurking from the mouth of Slate to the Naval Run Pool. Lord Nelson's Gallery, located in historic downtown Gettysburg, Pa, has been a long time supporter of the Slate Run Tackle Brown Trout Club. They have donated many high quality limited edition prints over the years to be raffled off and the proceeds go to buying the Brown Trout that are stocked in the Delayed Harvest Area on Pine Creek. Any one who has caught one of these spectacular trout can attest to their quality. Just seeing these fine trout feed on the surface is a thrill, and can cause a lot of excitement even among the most experienced anglers. Their fine art and prints can be seen on WWW.lordnelsons.com or call them on 800-664-9797. The club raffle runs from June through November. The funds go to the cost of trout for the project. Tickets are available at our store. Slate Run's water is off color due to Friday's 1.5 inches of rain. BWOs, Quill Gordons and both the Little Black Stoneflies and the larger Brown Stoneflies contiue emerging in good numbers later in the afternoon. Water levels are strong, but fishable in a select number of areas.. Target the shoreline and seams. Slate Run is flowing strong and slightly off color due to Sunday Friday's rain. The coming week should provide agler's with ideal conditions. Streamers and Woolly Buggers will be good bets until Slate Run clears, then switch to a Bead-Head or Weighted Nymph on the point with a Soft Hackle dropper. In mid-to-late afternoon, tie on a size 14 Gray Parachute Adams and enjoy the action. Cedar is running off-color due to recent rains. Same as on Slate Run. Water levels are strong but fishable in a few areas. You will have to take caution when and where you cross until the strong flows ebb somewhat. Conditions are very similar to those of Slate Run. Fishing should improve as Cedar Run clears beginning Sunday. Same as on Slate Run!